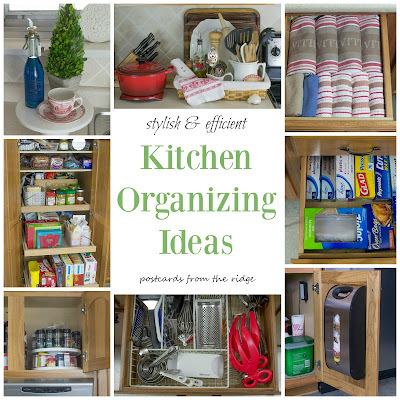 Is being more organized one of your goals? It is for most people, including me. There are so many ways to organize things. Whether you use boxes, baskets, bins or bowls, it's a great opportunity to get creative and show your personality. 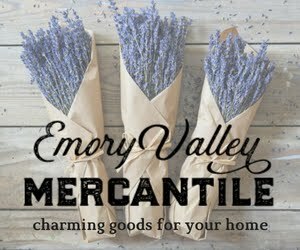 I love to think outside the box and use items for something other than their intended purpose as storage, like picnic baskets, wooden crates, or as you'll see in this post, milk glass that I've picked up inexpensively over the past few years. 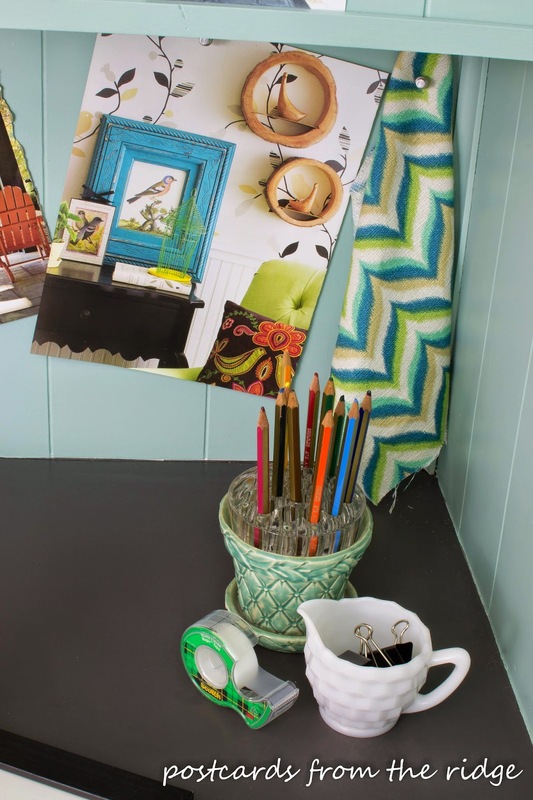 Thrifted finds are a great way to store many things, including craft supplies. Almost all of the items used for storage in this room were found at yard sales, thrift shops, rummage sales, etc. Etsy and ebay are great sources for versatile containers too. This craft room has been a work in progress for a long time now and I've shared some of the progress with you before. It's a space that needed an extreme room makeover and has come a really long way from what it used to look like using mostly paint to make some dramatic changes. 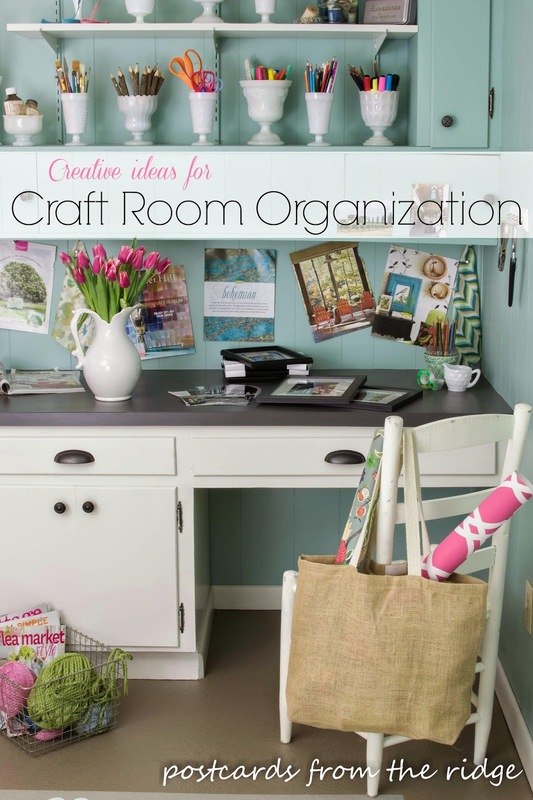 You've already gotten to see how the counter top got painted here, and how the floor got dressed up with stencilled faux rug here, and now you'll see some of the fun ways our craft supplies are organized using found items! 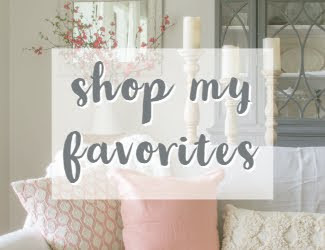 Vases, compotes, bowls, and anything that can be used for coralling all those supplies and can also make a fun statement allowing you to show your off your style. 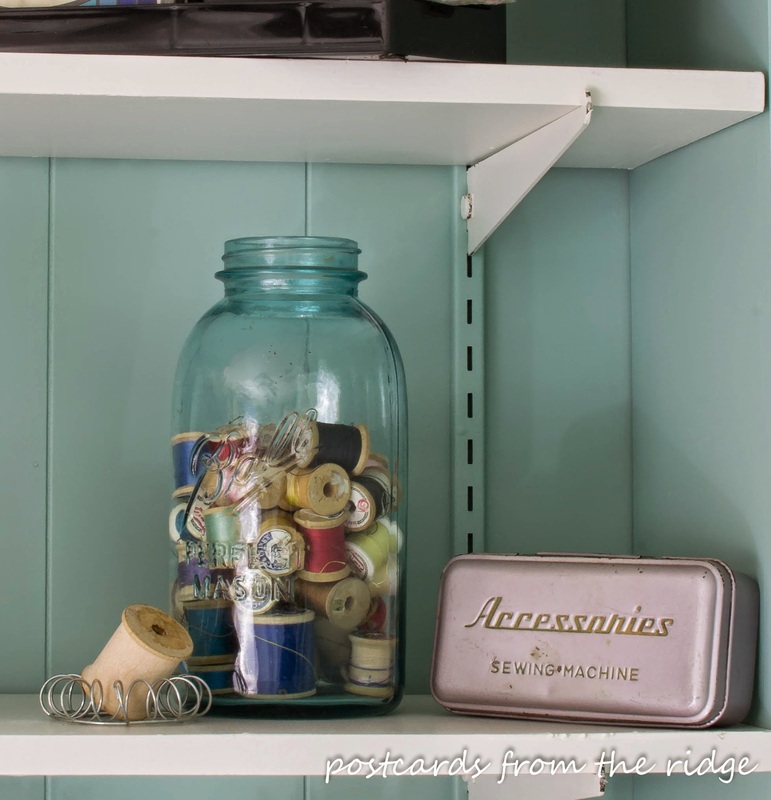 A large mason jar is a great place to store spools of thread or other small items like buttons, trims and ribbons. (I love the old wooden spools of thread!) The old sewing machinge accessories box is fun place to stash things as well. Different sizes make it more interesting and enable you to store a variety of shapes. The wooden spools of ribbon and markers fit perfectly in them. A wire storage basket is great for holding yarn or medium sized items. Paint color decks are stored on the top shelf in another wire basket with a handle. On the right wall, scissors and a hole punch are stored on a key rack. 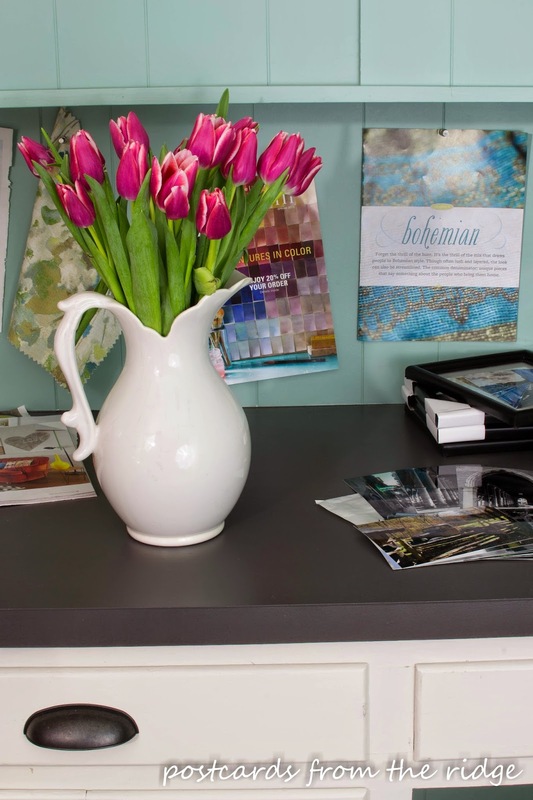 While the old white ironstone pitcher isn't currently being used for organizing, filling it full of grocery store-bought tulips sure does inspire creativity. 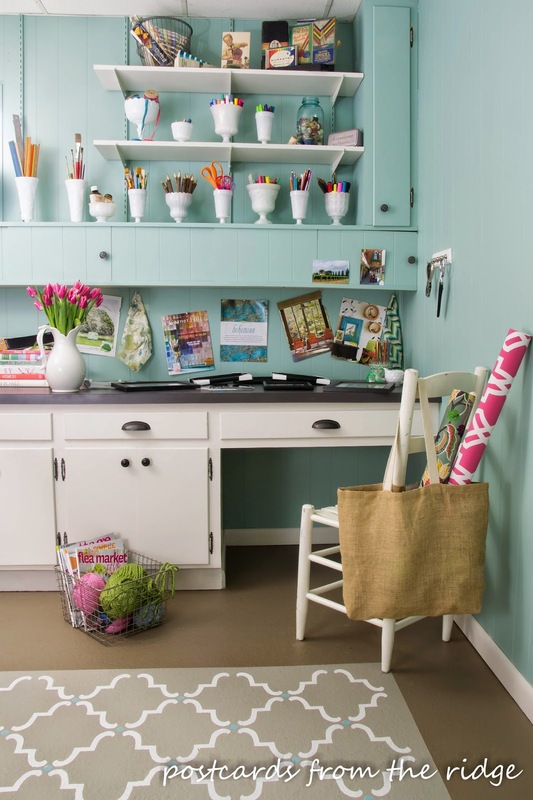 It could be used to store wooden dowels, long paint brushes, knitting needles, or yardsticks. Remember the days before pinterest when we tore out pages from magazines that we loved? Some people (me) still do that even though they're on pinterest. 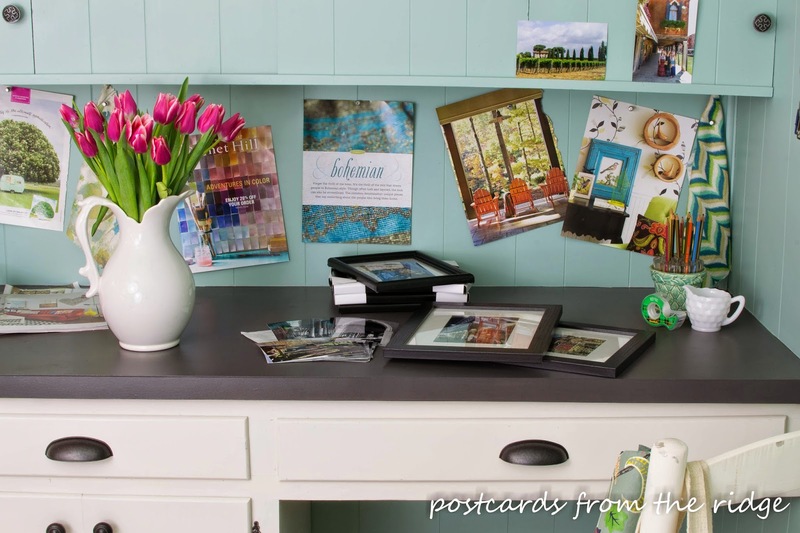 The pages can be pinned to the wall or a bulletin board as added inspiration for upcoming projects, or just for something to dream about. 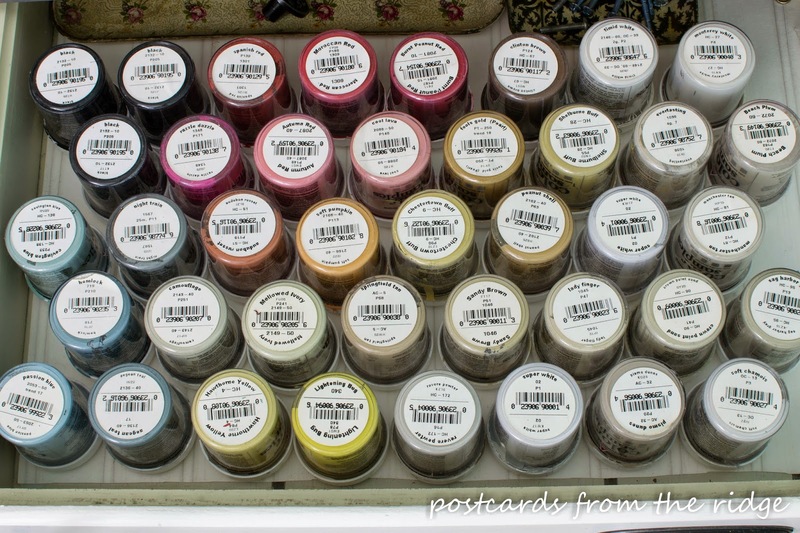 Small sample jars of paint can be stored upside down in desk drawers. This keeps them from drying out and allows you to see what color is inside. 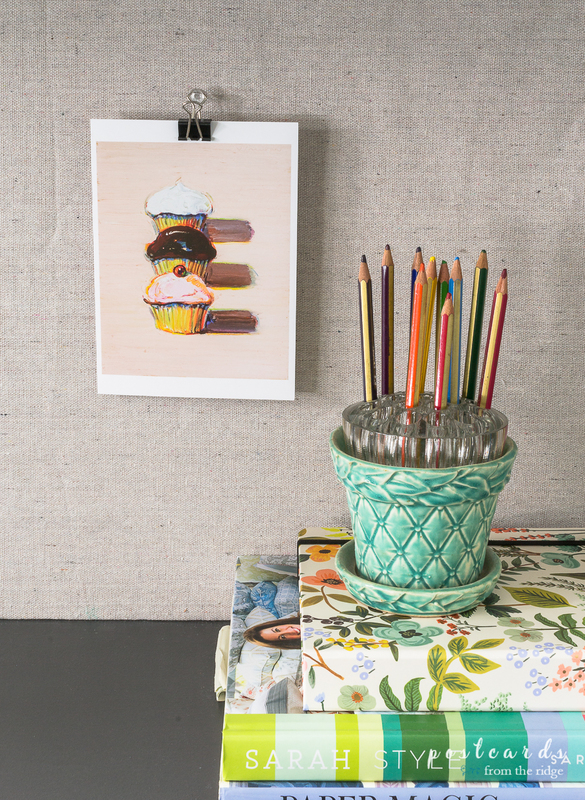 A little McCoy planter with a glass flower frog on top is a fun way to store pencils. Thumbtacks and clips are easily accessed from a small milk glass creamer. 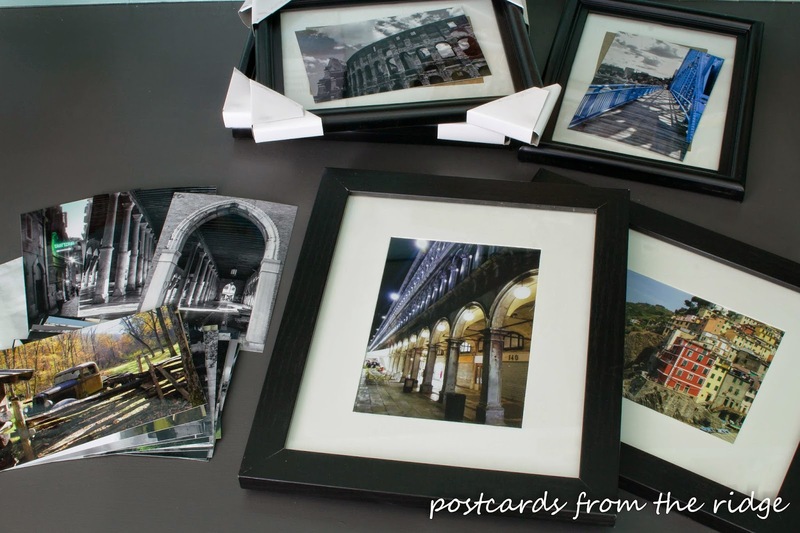 And speaking of being organized, we're currently organizing some of our photos and having them printed so we can frame them and create a gallery wall for our living room and hallway. Hopefully this project will be finished soon. Gallery walls take a lot of planning, printing, and framing! Stay tuned for the completion of this project. 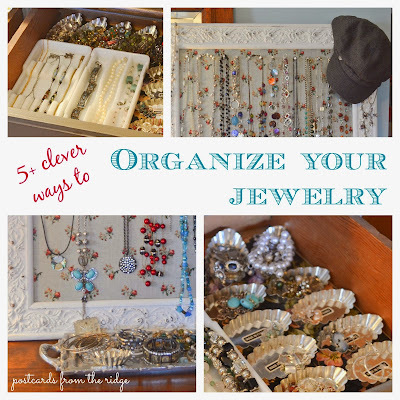 Need some ideas for using found items to organize your jewelry? Go here for some fun tips that will help with that. 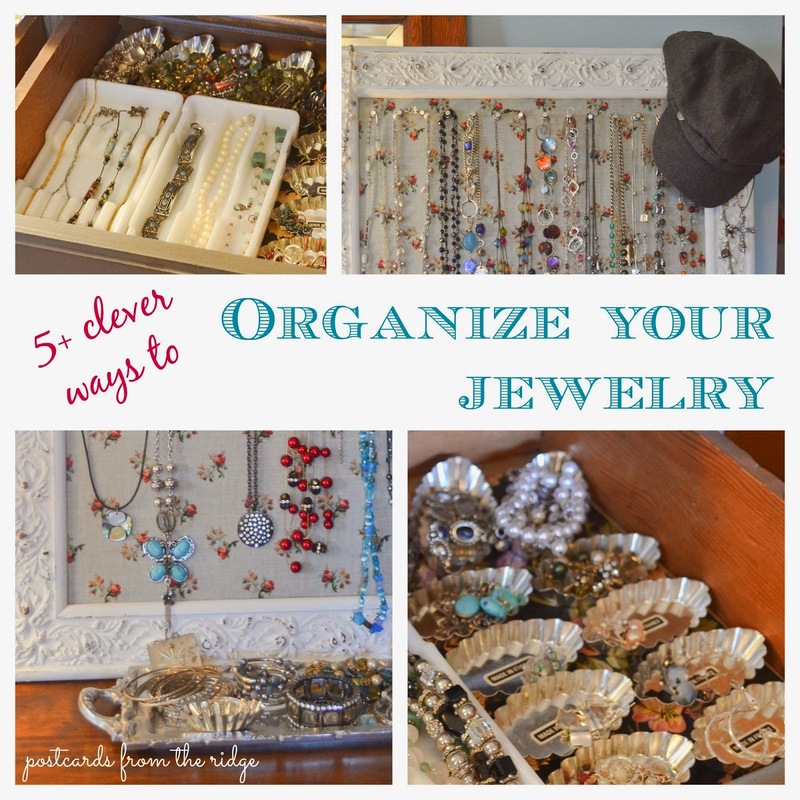 What are some creative ways you organize your things? I'd love to hear your ideas! 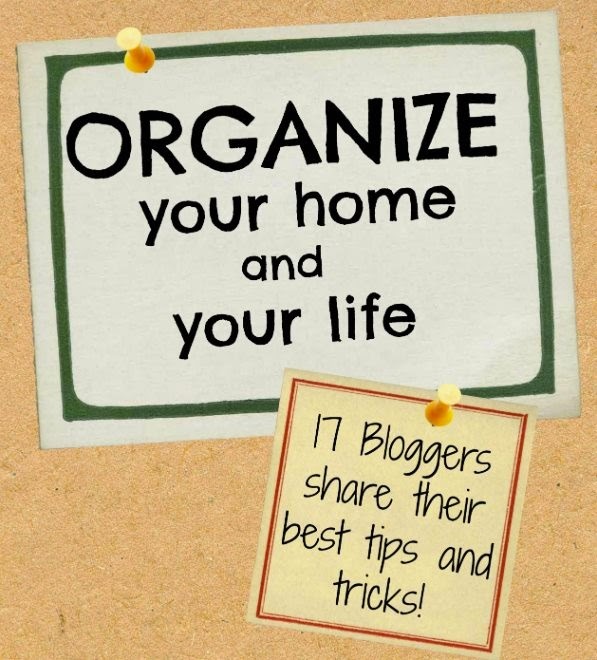 Don't forget to scroll down and see my talented blog friends' organizing ideas and tips! Let me know which ones are your favorites! 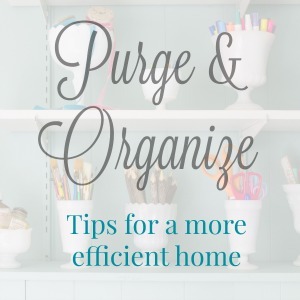 For more home organizing tips go here. Your post is perfectly timed! I'm working on my studio/office and am looking for creative ways to hold and display my tools, paints and other needed items:) Your milk glass is so pretty! Love your craft space! 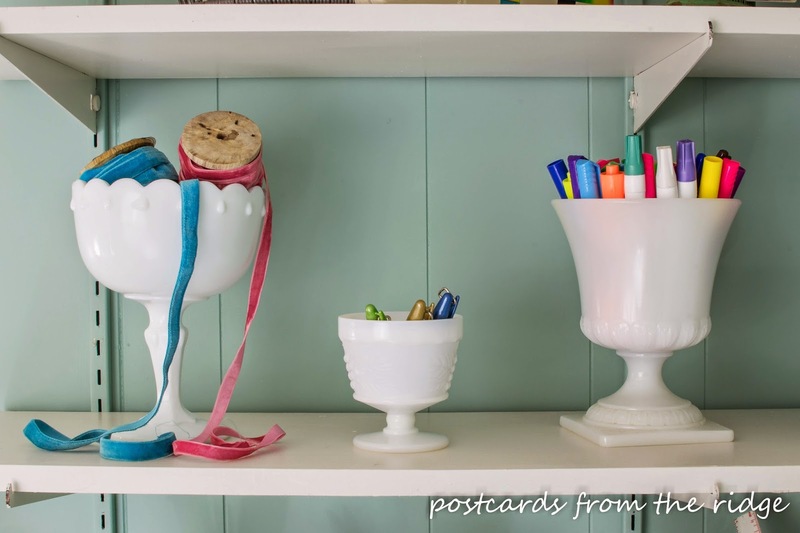 I love how you used all the milk glass to corral your things - so pretty! Angie your crafting space is so beautiful and organized. No wonder you come up with so many great ideas! I wish I had a space like this, or any space at all. 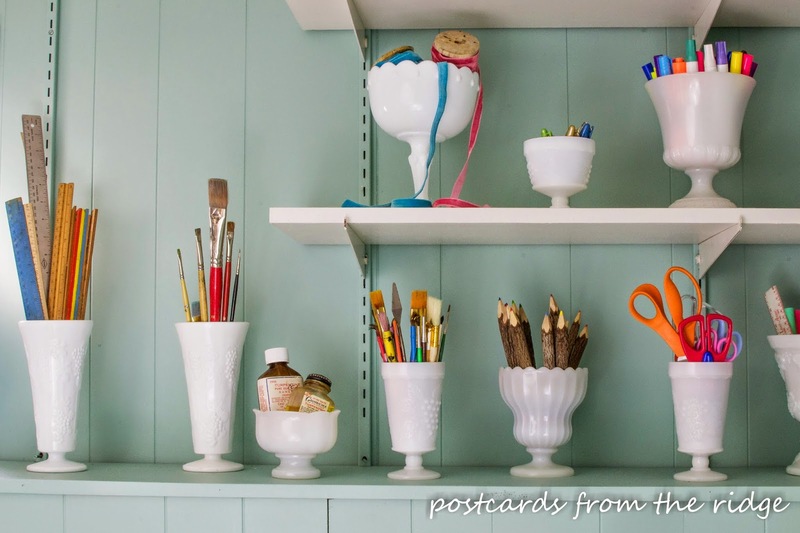 :) I love the milk glass storage and I gotta say I think it's genius that you painted the shelf-rack-holder-things the same color as your wall! Wow this is gorgeous! I need to get my office organized like this so bad, I can't be creative in clutter. I love the use of the white vases so pretty! Beautiful job! Thanks, Dria! It's definitely taken a while to get in to this point. I'm going to have to try really hard to keep it this neat! 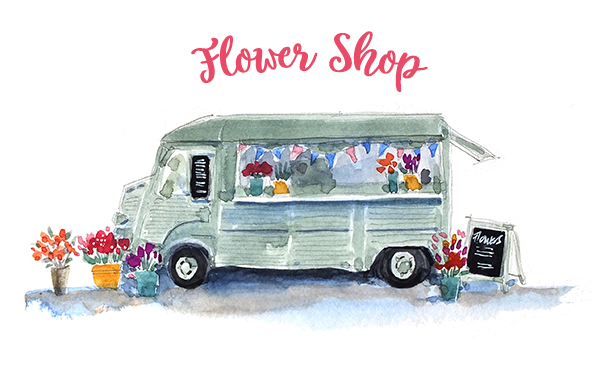 I am so envious that you have such an amazing dedicated craft space. Moreso that you have it decorated so beautifully! I am sure you enjoy your time in there! 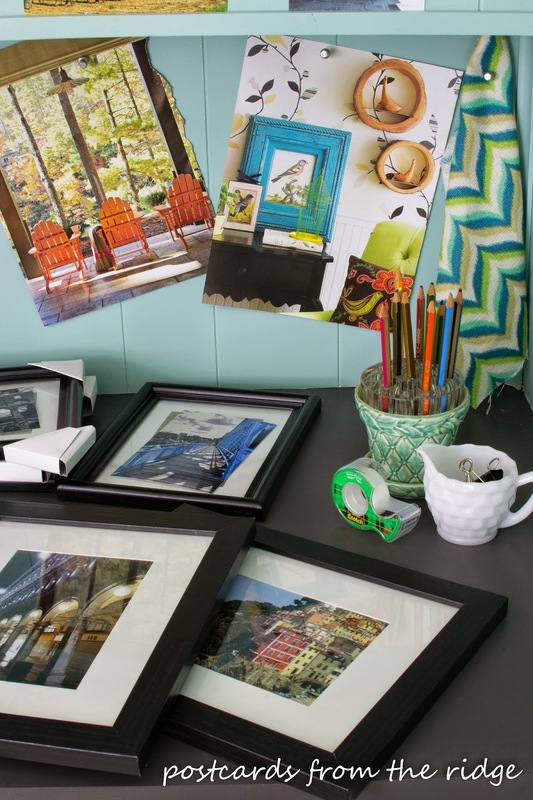 Your craft room is so pretty. I really like you used the vintage items to hold your crafting supplies and the color is gorgeous! Thanks Mary Beth! I love repurposing vintage items. And the color keeps me inspired! Oh my gosh! 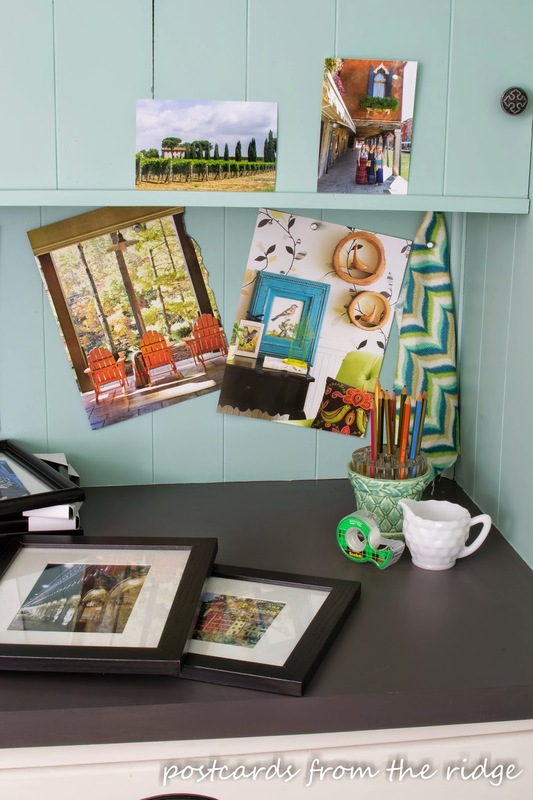 I want to hang out in your fun craft room! Your stylish creative organizations is on point. ;) Love it! Thanks Therese! It's a really fun place to hang out and create in. I love your craft room. Lovely and the wire baskets are great idea too. Thanks Vanessa! I love using wire baskets. They're so versatile! Thanks so much! So glad you like it. And thanks for the feature. I linked up our valentine's mantel this week! What great ideas! I have a great craft room that I am slowly getting organized and this is my inspiration! Thanks Renee. It's definitely taken a long time to get it this organized. Slow progress is better than no progress! Keep plugging away and you'll get there eventually. I love all of the clean white storage Solutions. It makes the space look very uniform but beautiful! Thank! So glad you like it! I just love this space Angie!!! LOVE! Makes me want to get going on my little office! Thanks Nancy! So glad you like it! Thanks Angela! Glad you like it! I'd love to link up. I'll have to set a reminder so I don't miss it.